Walnut dresser to complete my bedroom set. Most difficult project that I have tackled to this point, as it took several months to complete. Drawer fronts are solid walnut, with remainder of drawer being dovetailed, solid pine. 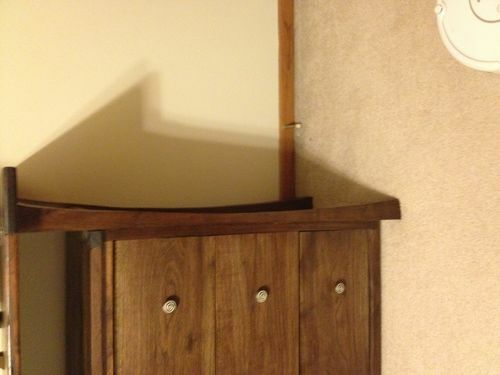 Dresser sides are curved. Top is burl veneer. Haha. I couldn’t figure out how to rotate the pictures. Good thing I’m a better woodworker than a computer person. Very very nice dresser, the walnut is beautiful as is the design. I like the jewelry box on top (or at least I am guessing that is what it is) it’s like a little mini Me addition….Great job. I’m a sucker for walnut, it is the king of woods. Love the tapered legs on this and the design! Very Nice Project Indeed! Well Executed also! Thanks for Sharing!